Imagine a world a millennia from our current time line. Humanity is still engaged in warfare, but now has it down almost to an exact science. Government-funded armies still exist, however there are also independent mercenary groups for hire ready to engage in campaigns. In this enjoyable sci-fi action and adventure, author Jed Fisher has conjured up an entire universe in such detail that the reader can easily become engrossed in it. 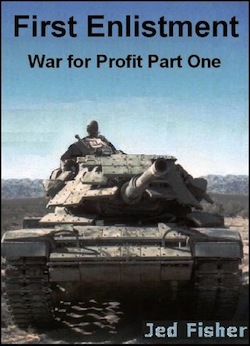 First Enlistment: War for Profit Part One follows a group of boys fresh from one of many military academies, as they enlist for their first taste of warfare. First Enlistment, the first book of three currently in the War for Profit series, focuses on the details of soldiering; for example weapons training, and tactics. In particular, the author focuses on a cadet’s mission inside a tank and the technical knowhow that goes along with it. The book is very action oriented, and draws heavily on the author’s military background. As I continued reading, I found myself thinking of this book as a sci-fi inspired telling of Full Metal Jacket. The story focuses very heavily on military themes, and very little on the backgrounds of its characters. It does not delve into how or why they ended up on different planets that don’t seem to be located in our galaxy. This however is not necessarily a detriment to the story though, as readers with similar interests will feel right at home, but I would have liked some of those other elements to be more fleshed out. I liked the author’s story line and the characters were more or less believable. I did feel that the characters were not quite developed enough. It’s hard for me to put my finger on it, but the writing seemed “light,” incomplete, not quite enough depth. This book is also a little fast paced at times, and clear time frames that might have helped with this have been left out. It holds up like any good science fiction and I think you will enjoy this book. So if you enjoy military and or sci-fi stories I know you will not be disappointed with First Enlistment: War for Profit Part One.